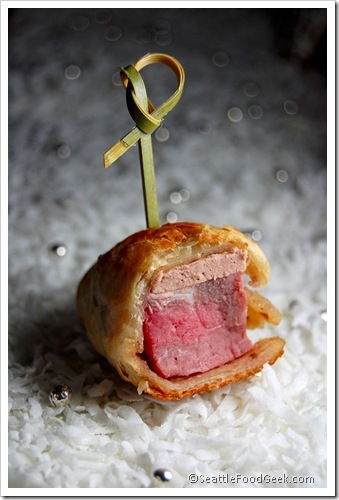 I love the richness and elegance of beef wellington, particularly for fancy winter dinners. Beef wellington, if you haven’t had it before, is a medium rare slab of steak, topped with fois gras and mushrooms, then wrapped in puff pastry and baked. The dish can be an expensive proposition, so I’ve transformed it into economical hors d’oeuvres. Preheat the oven to 425°F and set the top rack in the middle of the oven. If you are starting with an uncooked beef tenderloin, season it to taste and cook until rare. Allow the tenderloin to come to room temperature before carving, at least 30 minutes. If using pre-cooked tenderloin, remove from the packaging and wipe all sides dry with paper towels. Cut the tenderloin into long, 1” square strips. You should get about 3 good strips per tenderloin; the rest can be saved for excellent next-day sandwiches! Line a baking sheet with parchment or a non-stick mat. Lay out one sheet of puff pastry and place the cut tenderloin about 1/2” from the top edge. Spread a little of the pâté on top of the tenderloin. Then, carefully fold the puff pastry over the tenderloin, rolling the meat and the dough until you’ve completely encased the tenderloin. Press the dough down at the seam to seal it. Using a sharp knife, cut the sealed portion of dough away and place on the baking sheet. Repeat for a total of three “logs” per sheet of puff pastry. Bake until the puff pastry is golden brown, about 10 minutes. Remove from the oven and let stand 5 minutes before cutting. Slice each “log” into 1” pieces, skewer with a toothpick, and serve! We were able to save a little cash by using chicken pâté instead of expensive (and rare) fois gras. We also left out the mushroom mixture you usually find in beef wellington – for our purposes, the mushrooms would be a little messy since they’d fall out the sides of the cut pieces. Trust me, your guests won’t miss them. the trick to getting the mushrooms to stay in place is to skewer the “log” with toothpicks before cutting it into pieces! I played with this recipe and learned a few lessons. First I made the quickie puff pastry with flour, butter and sour cream. It doesn’t work well with this. Second, I made the mushroom pate recipe I found on line. Although I thought it was to strong on the curry side when I made it, once it was around the tenderloin it was just right. I made bernaise to drizzle and everyone loved that combination. I bought fillets and cut them into logs. A few I put the pate right on top of the meat and then wrapped it, sealed with egg wash and painted the top before baking. The rest I spread it all over the dough then wrapped the meat, sealed it with egg and painted the dough with the rest of the egg. All in all, I would say the filling on top was plenty and the dough stayed around it better. So, next time store bought puff pastry will be used, pate just on top of the meat and it should be a show stopper.